I was raised to believe that you had to eat green vegetables very frequently or you would evaporate or implode or be taken away by a spacecraft; well, not sure what would happen but it wouldn’t be good. This worry was somewhat squelched when I met a friend in high school who lived on hamburgers and Doritos and seemed whole and alive, but the paranoia still prevailed, if only in the back of my mind. Seriously, because of my previous conditioning, there was a culinary cloud over my head when my kids would not eat beans or the dreaded peas. One evening, my eldest son, while out at a restaurant with the family, started eating his beans. Happily. I inquired “who are you and what have you done with my son?” He shared with me that these “restaurant beans” were good (unlike my humble version at home). Take two handfuls of fresh string beans and cook them briefly in a steamer basket for 3-4 minutes over boiling water, then follow one of the ideas below, depending on what is in my pantry, fridge and garden at the time. 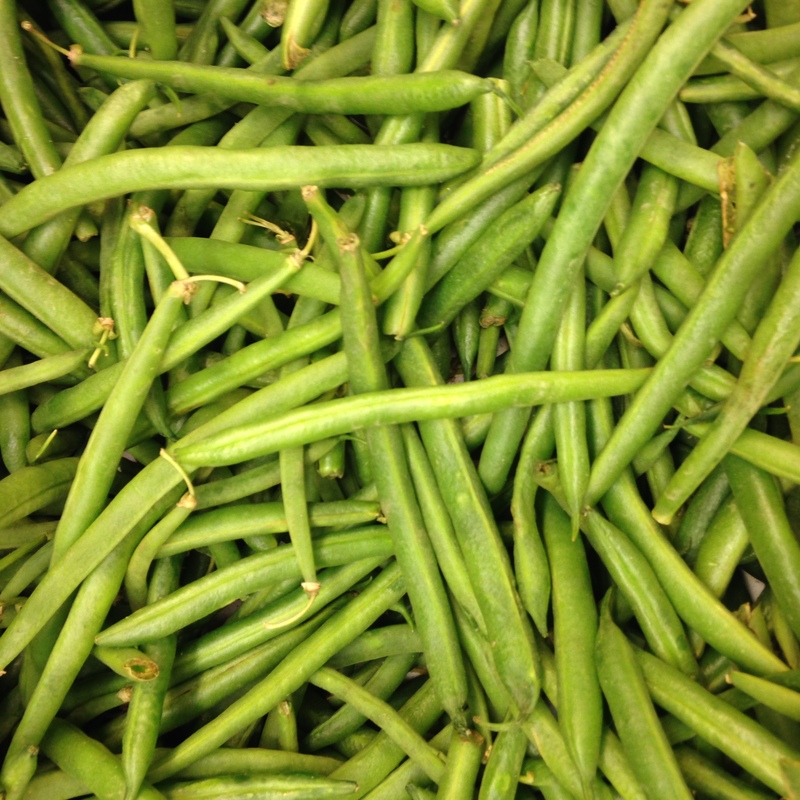 Tip: My favorite beans are the thin French versions – haricot verts – but the big American ones are fine if they look nice and the skins are clean of brown lines and bruises. For the large string beans I cut not only the ends off but then cut them into shorter pieces with angular cuts (see photo). I have read that you only need to take off one end of the bean and the more tender pointy end can remain, most restaurants trim them in this way. I take both ends off, who needs ’em? 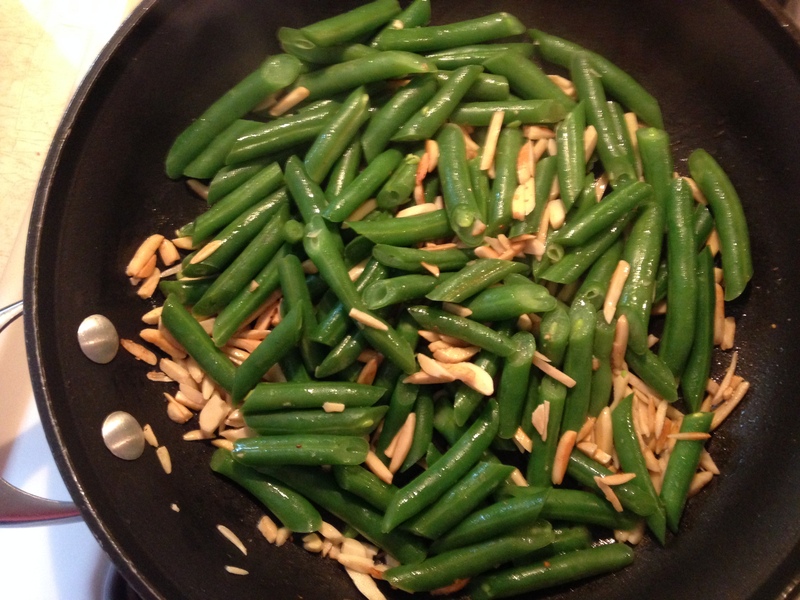 While the beans are steaming, heat 1 tbsp of butter in a large skillet then throw in 1/2 cup slivered almonds and heat on medium. Don’t let the nuts go dark brown or they will taste bitter. I hit the nuts with 4 grinds of salt and 2 of pepper (enough to season the beans as well) and when the timer on the beans rings, dump the beans into the pan and sauté them with the almonds and butter for a couple of minutes, check for seasoning, then serve. While the beans are steaming I warm up 2 tbsp of olive oil in a large non stick pan, and cook 1 shallot for 3 minutes until soft over medium high heat. Tip: Either cut the shallot in half longwise and thinly sliced into half moon strips or cut into small diced cubes like you would an onion, first long cuts down the half shallot, then across. Hit the shallots with 3 or 4 grinds of salt right when they hit the oil, this will help pull out the water, and you need to add enough to also season the beans. Once the beans are slightly steamed, dump them into the shallot and oil mixture and saute to doneness, (another 2 or 3 minutes) check for seasoning, then serve. While the beans are steaming, warm up 2 tbsp of olive oil in a large non stick pan, and cook 2 cloves of garlic for 2 minutes over medium low heat (don’t overcook or it will become bitter, if it turns dark brown dump it and start again). Tip: To get the cloves into small pieces, smash them with the heel of your hand, peel them, then just chop into small pieces. You can use a garlic press but then they turn into mush. Once the beans are steamed for 3 or 4 minutes, dump them into the garlic and oil; saute for another couple of minutes, taste for seasoning, then serve. When my husband’s cherry tomato plant provides us with a handful of ripe cherry tomatoes, I prepare the beans like the garlic beans above, but also add in tomatoes. See recipe above, but once the garlic has had 2 minutes on med low heat, raise the temp to med high, add in all the tomatoes (cleaned and large ones cut in half) salt generously (tomatoes love salt) and get them cooking for 5 minutes. a few minutes into the tomatoes cooking, drop the beans to steam for 3 minutes then dump them in with the tomatoes. Cook another 3 or 4 minutes, test for seasoning, then hit with some fresh oregano leaves and serve. 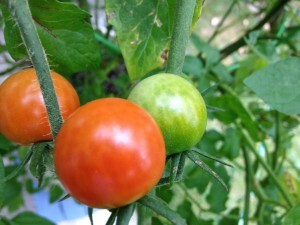 The proportions of beans to tomatoes depends on what you have ripe on the plant – add as many tomatoes in volume as beans, but you can certainly can add less if that’s all you have! 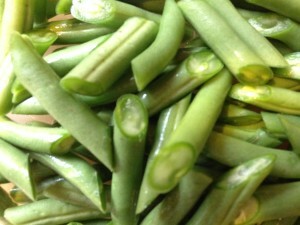 For one last idea, see lemon bean surprise.